Riding along the Medina, image provided by Deb Demers. From the North or East: Take I-35 south (toward Laredo) to exit 140, Loop 1604. Turn Right onto Loop 1604 and drive 2/10 mile then turn Left onto Quintana access road. Drive 2/10 mile, cross RR tracks and make an immediate right turn onto Quintana Road. Drive 9/10 mile to first road on left, Trawalter Lane. Make left turn onto Trawalter Lane. Drive 7/10 mile and Alamo River RV Ranch is on your right at the end of Trawalter Lane. From the West: Take I-35 East to Exit 140, At end of off ramp turn left onto Loop 1604 and drive 3/10 mile then turn Left onto Quintana access road. Drive 2/10 mile, cross RR tracks and make an immediate right turn onto Quintana Road. Drive 9/10 mile to first road on left, Trawalter Lane. Make left turn onto Trawalter Lane. Drive 7/10 mile and Alamo River RV Ranch is on your right at the end of Trawalter Lane. From the North on Loop 1604: Proceed South on 1604 to 4-Way Stop sign at Old Pearsall Road. Go straight ahead 1 mile and turn right on Quintana Access Road and then an immediate left onto the Access Road. Drive 2/10 mile to next intersection and turn left onto Quintana Road. (Do NOT cross RR tracks). Drive 9/10 mile to first road on left, Trawalter Lane. Make left turn onto Trawalter Lane. Drive 7/10 mile and Alamo River RV Ranch is on your right at the end of Trawalter Lane. View of the Medina River from the trail. Provided by Deb Demer. Camping: Overnight camping with your horse is allowed! 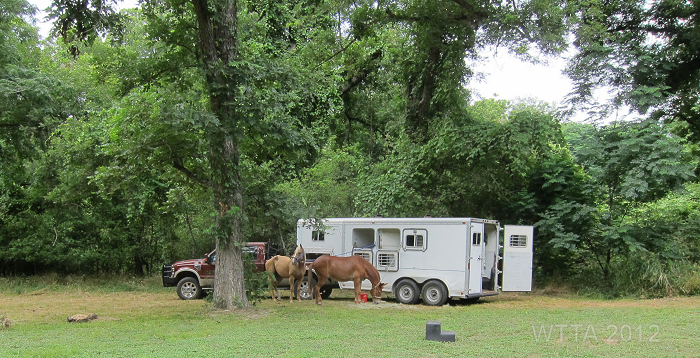 Horse camping is allowed on the lower campground which is located at the back of the park. Once you drive to the back of the park you take a right and head down hill on a cement driveway. 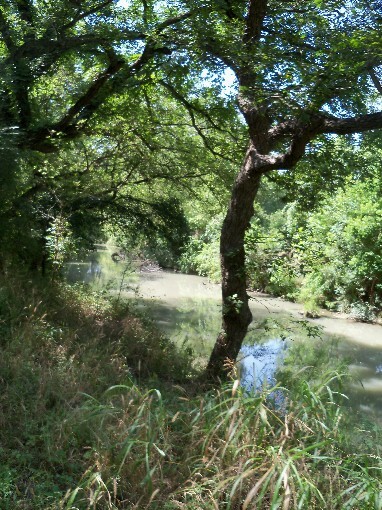 This area of the park is beautiful, lined with large oaks and pecan trees, and it is just off of the Medina River. There is no lack of shade in this section of the park. The upper campground normally does not allow horse camping. night and the rate for the full hookup sites down below (at the bottom of the concrete drive) are $45 per night. Water only hookups on the lower campground are $25. All of these include Free WiFi.Rates may change over time so always call before you haul. Cabin: The park also has a Bedroom Cottage which is $50 per night during the week and $65 per night on the weekend. Hours: Day use hours are 8am until sunset. If you are tent camping you are asked to be out of the park by sunset on the date of your departure. Cell Phone Coverage: Cell phone service is very consistent in the park and on the trails. You can get 4G depending on the carrier but 3G and 2G is very reliable. Dogs: Dogs are allowed but must be on leash at all times and not left unattended. The park asks that you please pick up after your dog. Dogs are not allowed on the trail with horses but you can walk them on leash. Hunting: Hunting is not allowed on the 96 acre park. There are lots of deer in the park because they know it is a safe haven. Trail Map: None at this time. Facilities: On the upper campgrounds electric and water hook ups are available for RVs and a bathroom/shower facility is also available but shade is limited. Horse campers are generally not allowed to camp on the upper campground. Horse campers are allowed on the lower campground where there is plenty of shade. In the lower campgrounds there are water but no electric hookups. Port-a-potties are located throughout the park. The park just procured their first pen! It is 12X12 with a ride through gate and has a red panel tube design. It is portable so that the pen can be moved. There is no extra charge for the pen. Horse camper designed sites are in the works and will be completed very soon. Terrain: The terrain is mostly sandy, shady, provides some river access, and goes from flat to hilly. The trails are very well maintained within the 96 acre park. The trails are well defined on the 300 acre tract but not well defined or maintained on the 1200 acre track. Be sure to stay on trail and be cautious of debris when on the adjacent properties, especially the 1200 acre tract. Image provided by Deb Demers. Update provided by Deb Demers – 10/20/16: The extra 300 acres is no longer available for riding. New fencing and cables have been put up to block access. Because of flooding and flood debris, we could not get across the river to check out the 1200 acres on the other side so I don’t know if that has been blocked also. So, at this point there is only about 45 acres to ride on. There were 3 spots were it would have be possible to slip across/through barriers, but not easily. As it is, looking across the barrier we could see that all the roads and trails were gone…..just tall weeds and brush. Probably once you got past the overgrown areas and back into the trees then the old trails could have been found, however at this point that area is off limits. Hopefully sometime in the future the areas will be open again. WTTA trail review contributor, Deb Demers atop Magic. Found a hidden gem! A few months back I started seeing an advertisement in Craigslist for a new riding area. It is Alamo River RV Resort in Von Ormy, a few minutes south of San Antonio. Although mainly a camping/fishing place, it did advertise trail riding. Looking online with Google Maps (under satellite view), you can see that it is a heavily wooded area, but looks small. The website says it 96 acres. So, I figured that was way too small of an area to ride. 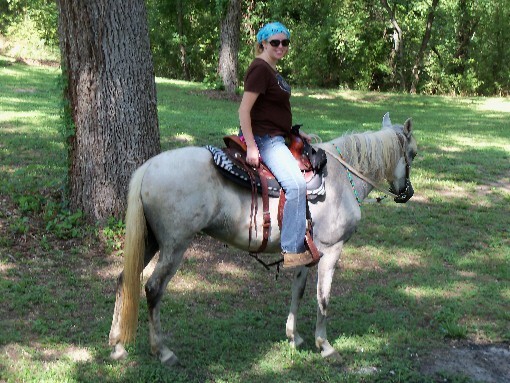 However, back in April this year (2012), there was a sponsored Cancer trail ride there, so that left me bewildered…..how could you have a trail ride there of a minimum of 2 hours with such a small area? So, I decided it was a good time to check it out. My friend and I decided to give it a try and I am SO glad we did. It was a wonderful surprise! Turns out that the park is 96 acres, but has permission to access neighboring acreage of 300 and 1200 acres (currently as of October 2016, due too overgrowth, flooding, and fences this is not accessible – so please call park to get most recent info). Upon arriving at the park, we saw a typical RV park, but once you turn the corner and descend down in the river basin area…oh what a surprise!. Thick woods of old and beautiful large trees covering the whole area. Camping areas are nestled within the trees and invite you to relax and enjoy the woods and river. The riding/hiking trails are all groomed or semi-groomed. 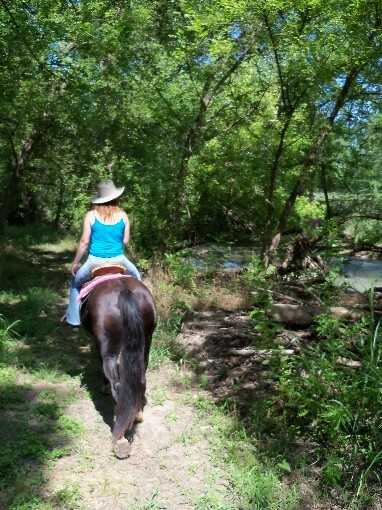 No shoes on the horses are required….the trails are sand and dirt packed. No rocks to clamber over. We spent hours riding and found that 95% of the trails are completely tree covered. As you ride, you may break out into a sun spot for 10-30 feet and then the trail retreats into the cool shade once more. 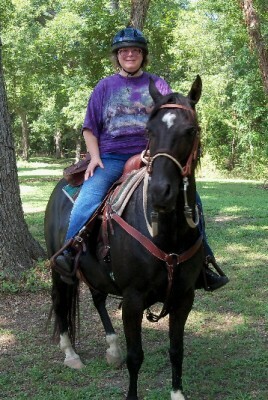 We rode in the 96 and 300 acre areas having a wonderful time on the great trails. There are quite a few places were you have hills you can choose to climb or descend – the size of the hills ranges from little mounds to big 30 foot high hills. None are scary, but some are just steep enough for a thrilling and enjoyable ride. 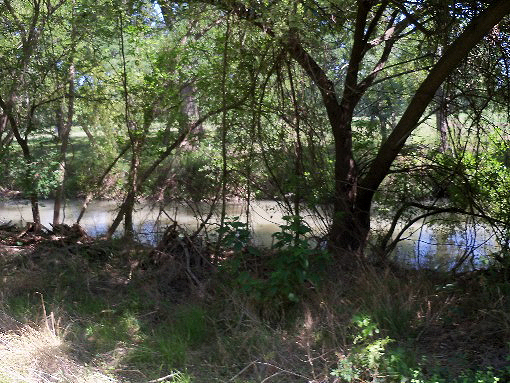 The whole area is bordered by the Medina River and, at one point, we enjoyed riding around in the river. The first two areas are the only ones with groomed trails. The additional 1200 acres is access by crossing the river and does not have marked/groomed trails. We have not ridden in that area yet. We are saving a ride in that area for later. I would highly recommend this as a riding area for anyone in the area. If you come from out of town, the camping is great and you can have a wonderful riding experience. 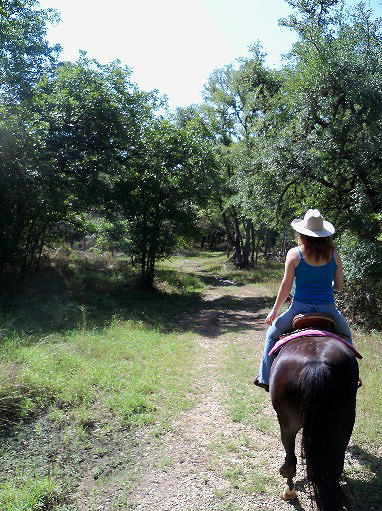 If you are used to riding in large ranches such as 7IL, this place may still seem a bit small, but for a day riding trip, it is great ESPECIALLY since it is completely tree covered to hide you from the harsh Texas sun and heat! Trisha and Maya at the lower campground area. Image provided by Deb Demers. The photos I took don’t really show the cool, dark shade and for some reason some of the photos are blurry. I’m thinking that my camera, trying to compensate for the dark shade and make the photos brighter did whatever cameras do to lighten the picture but that resulted in motion blur. So, you are not seeing how nice and shady the trails are. I did take a couple of “break out” photos showing were we were momentarily out in the sun. Cost for day riding is $10.00 and you have to show Coggins. Camping is $25.00. 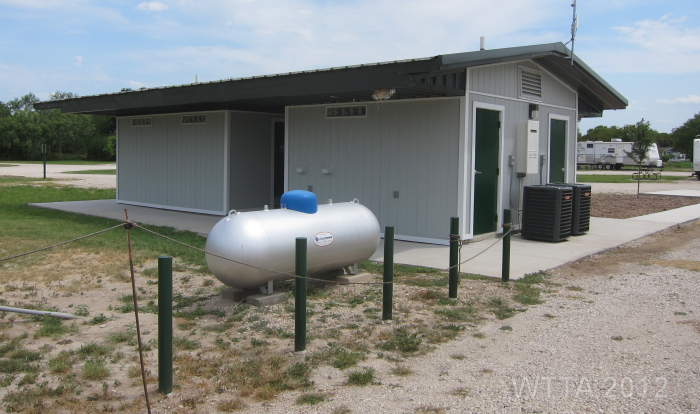 The upper RV area does have rig facilities (water/electricity) along with a shower/restroom building. The lower river basin area does not have these amenities, but it is a fabulous area to camp in – shady and cool. You can easily run a tie line for horses or put up portable pens. No shower/toilet building down in the basin, but there are port-a-potties scattered around. There is one small cottage that can be rented for $65.00 a night. There are some small pens nearby – about 5, but I don’t know if they can be rented. Thanks Deb for a great trail description and all the photos! WTTA visited this park in, but did not get the chance to ride there. The park managers, a super nice married couple, Ken and Nanette, are excited to have equestrian visitors at the park. Nanette is an equestrian herself. Ken shared the following, “We thoroughly enjoy the riders that spend time with us here and we are very sensitive to their needs and ALWAYS open to any suggestions that they may like to offer.We want to make the time they spend here a very pleasant experience and to have an environment that allows riders and (horses) to enjoy themselves. We have been very blessed with what we have here and love to share it…and of course Nanette loves to love on the horses that visit!” They hope to build on to the park so that it is even more accommodating to equine visitors. Ken was kind enough to give me a cruise around the park in their golf cart. He said there is all sorts of wildlife like deer, Mexican Eagles, and owls through out the park. He said there is even a white deer who frequents the park. Because there is no hunting in the park the deer flock to it, knowing it is a safe haven for them. Sure enough while cruising around in the golf cart deer where jumping out everywhere and I even got to see the white deer. I was kicking myself for not having my camera in hand. The sand pit area, image provided by Deb Demers. 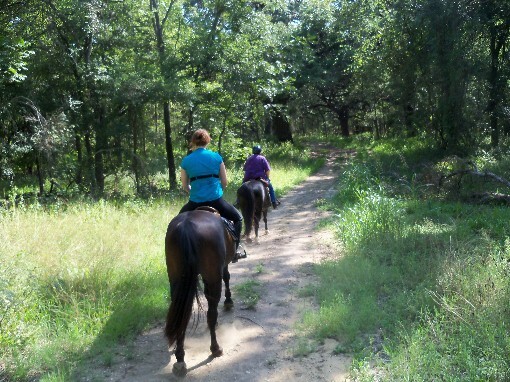 Christy and Deb heading down the shady trails at Alamo River RV Resort. Provided by Deb Demers.